Tilted Horizons: New Aerostich Inflatable Shade Tree! 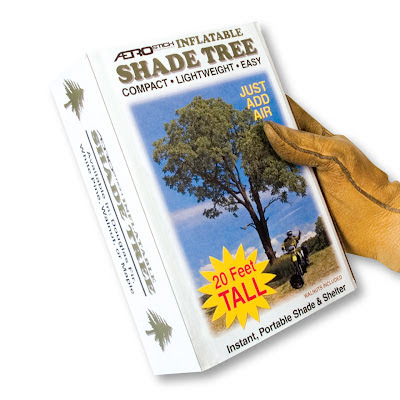 New Aerostich Inflatable Shade Tree! The biggest of 156 all-new items in the new 2012 Aerostich/RiderWearHouse catalogs...and a must-have on any road trip. Deploys quickly and converts any barren roadside area into an oasis of shaded respite. Available in four arboreal varieties: Douglas Fir, White Pine, Walnut or Maple. Each inflates to a full-grown 20'x10', yet packs small enough to carry along on every ride. Set-up is fast and easy with optional compressor/inflator. Enjoy nearly instantaneous shade in any environment. A survival aid in arid desert scenarios which makes impromptu repairs tolerable under even the most relentless broiling sun. Rugged Chinese-engineered construction ensures many seasons of trouble free use. Prices start at $309.17, including patch kit, Kevlar guy lines and Ti stakes. Forest pack deal: Fifth tree is free with purchase of four. Create a shaded oasis almost anywhere. Packs to a conveniently portable 8"x4.5"x1.25".